At the beginning of 2017 I set myself a personal challenge which was to upgrade my existing MCSA or Microsoft Certified Systems Associate for Windows Server 2008 to Windows Server 2012 R2. The reason for myself setting this challenge was due to more customers that I was working with using Windows Server 2012 R2 and just general improvement of my technical knowledge. For me Windows Server 2016 was still not mature enough so that is why I made the decision to upgrade to 2012 R2. Originally I had thought about just taking 1 exam (70-417) which would have allowed me to upgrade from 2008 to 2012 R2 however as I read through the requirements as well as testimonials online it soon became clear to me that this would be a much more difficult route to undertake. In fact the 70-417 is comprised of elements from 70-410, 70-411 + 70-412 and if you fail just 1 part you fail the entire exam. It was for these reasons that I decided I would take all 3 exams (70-410, 70-411 + 70-412) in order to upgrade my MCSA to 2012 R2. I was fortunate enough that I was able to secure funding from my employer (VMware) through their Take 1 program to pay for these exams so it was a win win situation and I had nothing to lose here. When I applied for that funding I stated that I would take all 3 exams in Q1 2017 however due to an unexpected increase in workload this plan had to be amended and deferred until later in the year to the point that I took 70-412 at the beginning of December. I sat the 1st exam 70-410 at the end of August, this would focus on Installing and Configuring Windows Server 2012. Of the 3 exams I found this the easiest and as a result achieved a high pass mark. According to the score report my strongest area was “Create and Manage Group Policy“. The 2nd exam 70-411 came soon after in September and this would focus on Administering Windows Server 2012, this was a harder exam as it would cover areas which I most likely would never come across in my day job but you still needed to know it. Again for some reason my strongest area was “Configure and Manage Group Policy“. I took some more time to study for 70-412 which covered Configuring Advanced Windows Server 2012 Services and as a result I did not take this until early December. Of the 3 exams this was the hardest and meant it produced my lowest pass mark but I was just glad to see that I had passed once I clicked finish on the exam. My strongest area here according to the score report was “Configure and Manage High Availability“. So after around 3 months of study and passing 3 exams I could finally say that I was a Microsoft Certified Solutions Associate on Windows Server 2012 R2 hence the choice of GIF in my tweet above and a few days later my Acclaim badge was released. 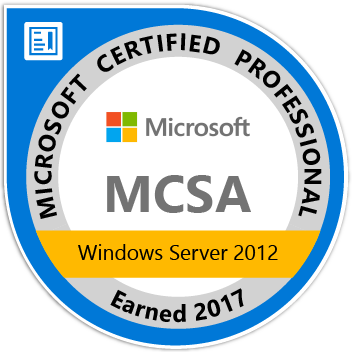 Now that I have my MCSA on Windows Server 2012 and with the changes in the way Microsoft is measuring success, I only have to take 1 more exam now to upgrade my MCSA to an MCSE or Microsoft Certified Solutions Expert. At this time I am likely to go down the MCSE: Cloud Platform and Infrastructure path and take 70-414 which covers Implementing an Advanced Server Infrastructure but this plan may change. This is the current goal for Q1 2018 but for now I am taking some time out to rest my brain, enjoy the Holiday season and also to study for the VCAP6-DCV Deploy exam. Thanks for reading and please feel free to leave a comment or message me on twitter (@lukaswinn) if you found this article useful.